Playing baseball is an excellent sport you can play with your friends; it can relieve stress and prove to be a lot of fun. 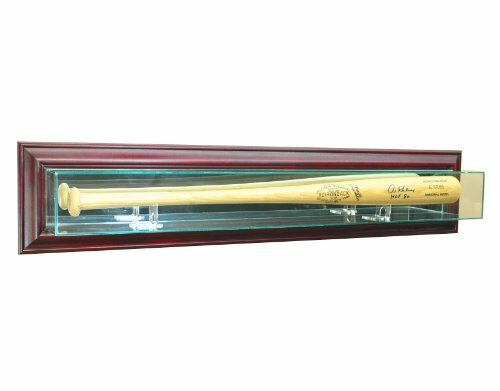 The best baseball bat display cases are rather expensive items. 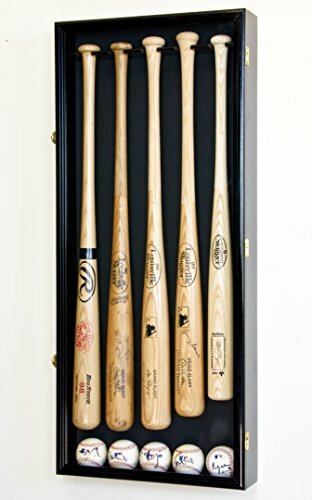 Thus, as a baseball player or collector, you probably want to get a safe place to secure your baseball bats and balls to avoid it from getting lost or damaged. When you own a bat, it is essential to have a baseball bat case. Whether you are a collector, a player, or an enthusiast, having one of these is a must- especially if you like to flaunt the bat around. 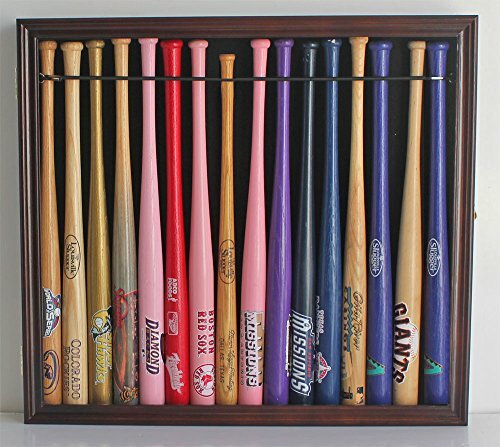 Finding the perfect display case for your bat can admittedly be hard. So, here is our list of the best baseball bat display cases you should see to help guide you in your journey in finding that perfect case. The very first in the list is the Steiner Sports Glass Bat Display Case. 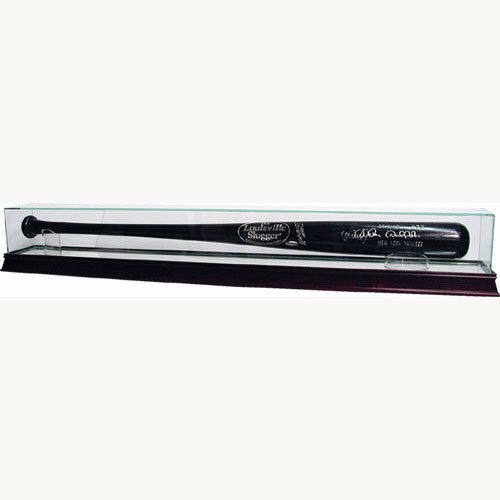 Like any other baseball bat cases, it displays your favorite collectible. It features UV-Protected glass that can protect your bat from specks of dust, particles, and even early signs of fading. The case itself is entirely handmade. It also includes a removable top for easier access to your bat. It has a lovely cherry wood base and combined with a mirrored bottom; this case finishes the look you’d like to portray along with your bat. 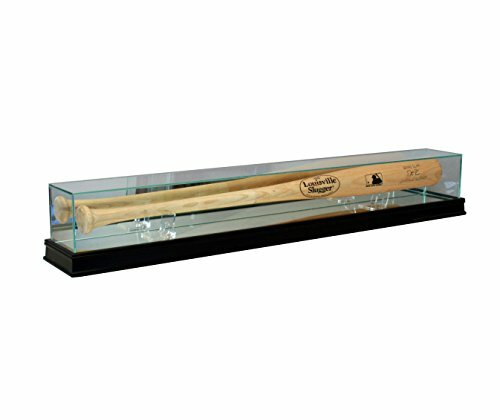 This baseball bat display case measures in overall size of 37 inches in length. However, the available space within the case is 36 inches in length, with a width and a height of 3.75 inches. With this kind of space, it is more than enough for your bat. Although, be careful whenever handling this case as it is somewhat fragile, shipment for this product must undergo meticulous procedures to ensure its safety. It is recommended to use latex gloves to not get any fingerprints on its glass casing. 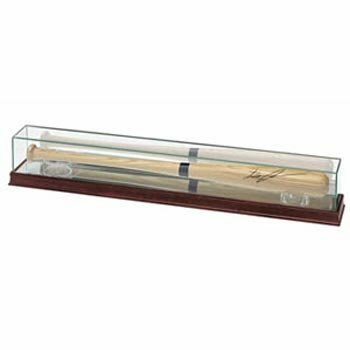 This baseball bat display case also has a UV glass case, ensuring that your bat will be protected from fading and dust. Not only can you use this case for your baseball bat but it is also ideal for miniature trains, cars, etc. The case itself is made out of a wood base (cherry base as well), it also includes bat risers and under-side pads for protection. The interior design is a mirror which makes it look sleek. Also, the fact that you can get the display case with a customized nameplate is a huge plus. However, the glass and mirror must be handled with care during shipping as it is somewhat fragile- the same thing can be said when handling it at home. The product might also end up getting broken during shipping due to poor packaging. Sadly, there are no instructions on how to set up the product, making it frustrating to use. Because of this, it is not recommended to those who have little to no knowledge in baseball bat display cases. The product is very fragile. The product does not come with instructions, therefore, making it hard to set up. This baseball bat case is perfect for those who strive for that aesthetic and cool design. This display case comes to you already in one piece with a classic dark mahogany finish entirely handcrafted by solid wood. It can accommodate baseball bat’s up to 37 inches in length. The display case can hang either horizontally or vertically, it also already comes with two sets of hooks. You can also lock the situation to make sure your precious bat won’t end up getting stolen. The display case also features UV Protection that’s great for dust. The case is rather heavy duty, but there are occasional issues with the screws of the glass casing being too loose. These occasions, however, are few. The case also has a felt interior background, appealing hugely to those who value design. But not only is it a statement it also protects your bat. If you buy this product, you are given a variety of baseball bat cases, from the colors black, cherry, brown to choose. You are also given the choice if you want it to have a UV Protective case, and whether you want your case to be engraved. All of the case’s glass tops can be lifted off from the base. They also come with acrylic holders, so you don’t have to buy any. They come in two sizes: 1 for the handle end and 1 for the barrel end. Position the holders, so the bat faces the way you want. Place them in the center of the mirror and place the bat on top. If you acquire the cherry color case, you can upgrade it to have sports molding. Take note that display is loose. The bat is supposed to lay on the top of the acrylic holders, but there’s a chance that if you move the case, the bat may roll of the mounts which could chip or damage the bat. This is because the holders are not designed to be secured to the base. Can be customized to your design. It offers upgrades to specific colors. Interior portion of the display is loose. Acrylic holders not designed to be secured to the base. This baseball bat display case is efficient. It is an excellent product for those who need a place to store the bat whenever they aren’t using it- but have plans to use it. It can easily be tucked away in whatever closet or small space. It easy to bring, carry, and store. However, its cylindrical design also makes it excellent for display, making whoever is looking at it have a complete view of the bat. The ultra clear tube keeps items secured inside it, and not only can you use this case for bats but for drawings, posters, playmats, and maps as well. It can keep whatever you’re keeping inside it completely clean and dust-free. However, there have been occasions where it’s cylindrical shape ended up getting bent or dented- especially when it’s under endurance. Not only is the quality of this case is impressive, but the customer service of the manufacturer is as well. It comes with wall mounts, so-called real wood molding, and real UV Protected Glass. You can choose whatever type of color you want the baseball design case to be (from black, cherry, and brown) and it looks pleasing whichever color you wish. You can mount this case up on the wall either horizontally or vertically. Don’t worry about the signature fading as this case is made with a non-acidic adhesive. Two clear acrylic bat holders come with the display case, and it can be arranged to hold your bat in either horizontally or vertically. The craftsmanship and effort truly did show in the baseball bat design case, making your bat pop whenever you look at it. It looks really classy and sophisticated, especially with its glass interior. However, it is a little unclear if bat holders come with the case. Customer service is very accommodating. You can choose whichever color you’d like to buy. It is unclear whether or not the bat holders come with the case. This baseball bat display case can not only hold one bat- but three. It can also carry three baseball balls as well. It is crafted in solid furniture grade beech hardwood and is finished with either deep black or mahogany. The case has a built-in lock that will ensure that anything you put inside it will be completely safe, it also has UV Protection with its glass. The case also has brass hardware and a felt fabric background that creates a stunning display. It also has easy instructions that make the set up more bearable. The case is moderately sturdy, the packaging for shipping makes damaging not a problem, the surface is very smooth and professionally finished. You can hang the case either vertically or horizontally. No assembly required as it comes all in one piece. Can hold three baseball bats and balls. Uses brass hardware and has a felt background. It is unwise to use this case when you will only hang one item to it. 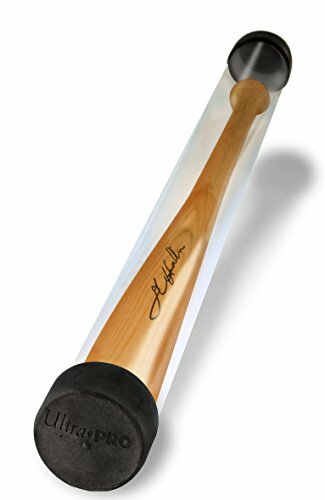 This protective case can hold up to 5 baseball bats and leaves spaces for balls. It is handcrafted in solid furniture grade Australian beech hardwood with an elegant finish of black, cherry, oak, or walnut. It also offers UV Protection like most baseball bat display cases. It comes with a built-in heavy lockable door latch that will protect your bats inside, and wall mounting hardware. The product will arrive to you fully assembled already. However, you have to mount the hardware on the back yourself. It’s not a problem, but the pre-drilled holes don’t line up that well. Also, the mounting brackets they provide require perfect measurement, or they won’t line up as well. Wall mounts don’t line up well; neither does mounting brackets. Now, this is perfect for baseball bat collector’s hearts. Its design is simple but sophisticated, having the capacity to fit three baseball bats and balls. The case itself is made out of Australian Beachwood and is already fully assembled when it gets to you- so you won’t have any trouble setting it up. The case’s interior is made out of felt, and you are given the choice to pick from two colors for it’s felt, either black or red. You are also given the opportunity to either get the case that can be vertically or horizontally hung. You don’t have to worry about your precious bats getting stolen, as the case comes with a lock and key. The case already has built-in hinges, so you also don’t have to worry about building/buying them in. Interior design makes the bat pop. There’s a variety of choices to choose from. The case comes with a built-in lock. It is recommended to use this when you already have three bats. Definitely a collector’s item. This display case can accommodate up to 18 mini baseball bats. You can choose on either having a mahogany or black finish, and it has a UV Door that protects your items from fading. The case has a built-in lockable latch that will keep your collection of miniature bats from getting stolen. This case is a good start for finding a place to put your bats. However, take in mind that you cannot hang this display case horizontally. This is a great gift to give to someone who appreciates baseball a lot but isn’t ready to make commit just yet. It’s always good to give someone some leeway before going all force. 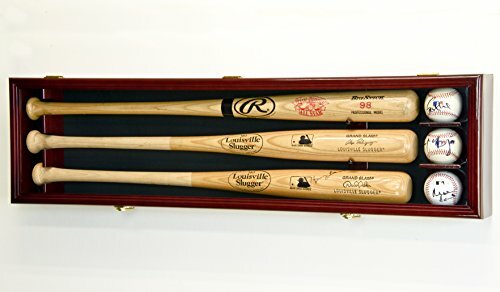 Although, this case isn’t for those who need a place to put all of their playing bats in, or primarily those who own bats that’s more than 18”. Offers UV Protection that keeps your items from fading. The product doesn’t store actual baseball bats. The product be displayed horizontally.